We would like to draw our readers’ attention, especially those who want to interpret the secrets of stars, to a nearly forgotten branch of astrology, namely the lunar astrology. We are used to follow the horoscope or to interrogate the specialist astrologer, regarding our situation, from the solar zodiac point of view, forgetting the entire information treasure that the analysis of our moon houses can offer. 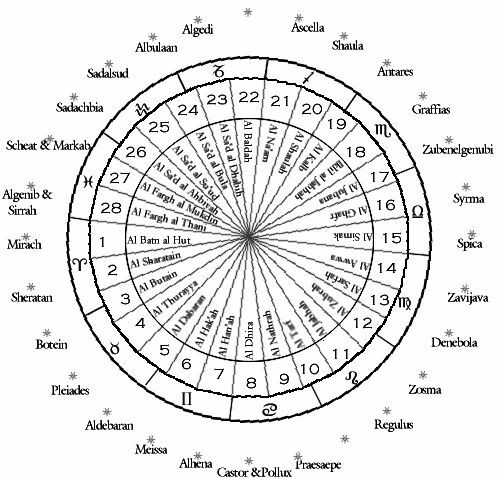 Well-known in antiquity, the Middle Ages and Renaissance, from the Chinese and Indians to the Mesopotamians, Greeks and Arabs, the lunar zodiac has played a very important role in the lives of humans, even without them knowing that. Apart from the planets’ influence in the 12 signs and houses, we can obtain much more information about ourselves and our personality’s predispositions, by studying the 28 lunar houses, also called Domiciles. The solar zodiac, based on the elusory movement of our central star, which transits the 360 degrees in one year, is much slower and fix than the lunar zodiac, based on the transit of the 360 degrees in only one month. From this point of view, we can declare the lunar one as more fluid and variable than the solar one, but we must take into account that in these houses we won’t study only the Moon’s movement, but also the one of the other planets. These are more rapid, as the Moon itself, Venus or Mars, or slower, like Saturn or Jupiter. The planets’ position in the solar houses define the active aspects of our personality, innate, visible things, which confront us our whole life, in one form or another, whereas the position of the same planets in the lunar influences domiciles, can bring us information about the unseen side of things, the occult, subtle, unconscious and often ignored one, which is also particularly influential on our lives, which we often confront day by day or from time to time and we don’t know why. It is known that the further a celestial body is from our planet, the weaker the influence of its field is. That’s why, the most important effects are those of the closest celestial bodies. Of all these, even if it’s not a proper planet, the Moon is the celestial body which affects the most the biological, psychical and mental sides of the human being, including plants, animals and humans. A natural satellite, made of a conglomerate of matter thrown on the orbit by the collision of a planetoid of the same dimension as Mars, named Theia, with our planet, billions of years ago. The moon is a part of Earth and the Earth can be considered the Moon’s mother. The human’s magnetic field is strongly connected to Terra’s magnetic field, tying our DNA to all the living beings’ magnetic field, through the law of induction. The other planetary magnetic fields can only sing their own notes in this symphony of energetic influences. The Moon is the most powerful influential body, being particularly close to us. Its magnetic field has a great energetic input towards our development. In a difficult but enjoyable task, we will try to define in the next articles each of the 28 lunar houses, together with the kabbalistic correspondences, the characteristics of each house and the planets’ behavior in each of them. 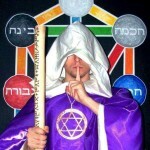 We will study the 28 lunar domiciles, mostly by the arabic tradition, making the following explanation: some of the works on the market are trying to assign the Hebrew alphabet’s letters to the 28 houses, to get some kabbalistic explanations. Not only is this thing done with extreme clumsiness and lack of knowledge about the Kabbalah, but it also contains a lot of errors, which won’t do anything else but to send the interested people on fake leads: the 5 final forms of the letters are added, making a total of 27. In order to reach 28 they have simply invented a new sign, supposedly a punctuation one, which doesn’t really exist in the Hebrew language. The real program-signature of the lunar houses is the Arabic alphabet, which does indeed contain 28 letters, the Arab civilization astrologically functioning on lunar coordinates. Not only is the language kabbalistically structured on the vibrations of the sacred number 28, but the Arabs are the ones who have popularized the system of lunar astrology and they are still using the lunar calendar nowadays and the symbol of the Islamic Empire has always been the…Half-Moon! The lunar astrology is a fascinating area, which can help us draw a better image of our inner construction, psychical, mental or spiritual and we don’t want to forget about it.